These beauties are ready for their closeup! 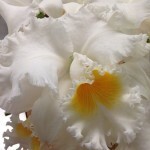 The Cattleya orchid, also known as the “Queen Orchids” are widely used in floral designs for weddings, parties, events, etc. They are available in a wide range of colors, sizes and forms. A great addition to your bridal bouquet or custom floral table arrangements.